Guess what? 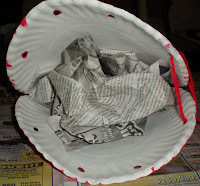 I finally came up with a craft. I guess my brain is starting to think in school mode, it's right around the corner. 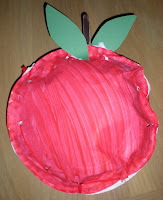 I know apples are a common fall and beginning of school theme. I have seen some great ones out there while I was surfing the web. I came up with this one the other day. 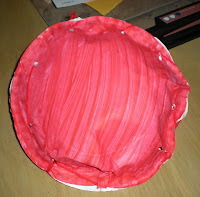 Take your two paper plates and put them together so that they puff out; bottoms of the plate out. 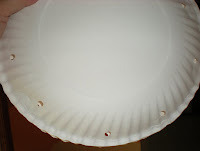 Here is a tricky part: using the hole puncher go around the edges to punch holes into the two paper plates together, they will need to be sewn together later. I marked two holes with a pencil so that I would be able to line up the holes later. The next step is to paint the bottom of both plates. I painted mine red as we do different things with apples when we talk about red. 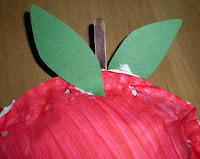 But, apples can be many different colors so feel free to improvise. 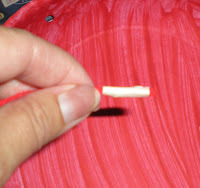 After the paint has dried, give the children a piece of yarn. I always wrap one end with masking tape to make it easier to "sew" with. Let the children sew the two plates together. Take a popsicle stick and let them break it in half, color with a marker. I put tacky on both sides of one end of the stick and glued it between the two plates. The final step is to add some leaves. I cut two leaves from green paper and glued one leaf on each side. In our room we like to hang things from the ceiling. These apples would be one of those projects. Remember, they may look good, but don't eat them! I LOVE this! how creative & so great for kids of different ages! I love this too! Can't wait to add it to my project list. Congratulations on your 100,000 visitors! That taffy idea for the tooth is genius! I'm going to tell my daughter about it when she gets home. She has another tooth ready to come out! Thanks!